Working in the consultancy after your PhD, something for you? 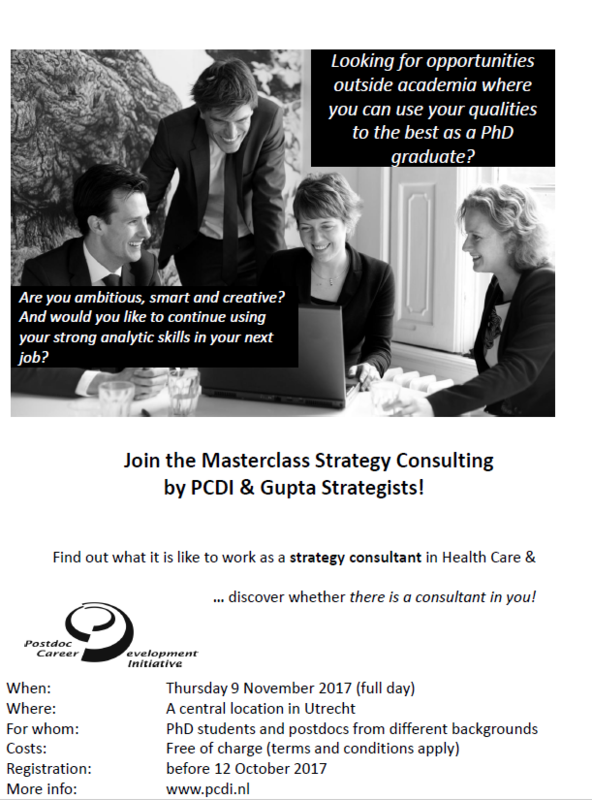 On Thursday 9 November, PCDI organises the Masterclass Strategy Consulting together with Gupta Strategists, a small consultancy operating for the Health Sector. 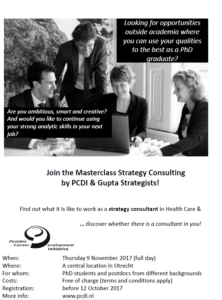 During the full-day programme you learn the ins and outs of what it is like to work as a consultant. PhD graduates who work as Gupta strategists share their experiences (PhD’s with different background). Together you work on a business case indicative of the kind of challenges they tackle in their work. The day ends with a dinner, the location is Utrecht. Spoken language is Dutch. The Postdoc Career Development Initiative (PCDI) is an organisation with a societal mission. Our aim is to stimulate the broad professional and career development of early career researchers who (are about to) have a PhD in order to get the most out of their potential; to make use of their talent to contribute to science, society and the knowledge economy. PCDI works together with PNN. Previous PostSurvey on the contribution of PhD candidates to Dutch university education. Next PostJumpstart your business career in Life Sciences!